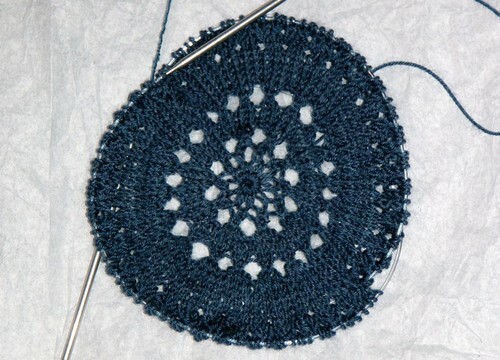 This blog has been rather neglected of late while I’ve been doing a lot of secret knitting. A few things (gifts) have recently become un-secret, so I’ll show them soon. But first I have something else to share. I spent a good part of tonight pacing back and forth across my living room and down the hallway. Why? 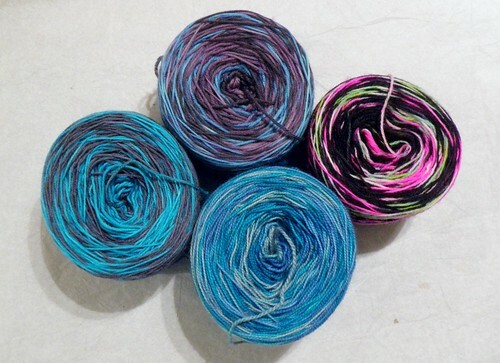 In case you didn’t know, dyeing self-striping yarns is lots of work. You have to re-skein the blank yarn into extremely long skeins – this weekend ours ranged from 30-45 feet around – in order to get long enough sections to form a stripe. I always remember this when I see people complaining about the price of hand dyed self-striping yarn. They probably don’t realize how much work goes into it! After running in circles around Stephania’s basement, we put on the dye. I dyed three skeins – two and three color striped skeins with equal stripes, a three color that has long blue/short grey/long purple/short grey, and dyed half of an existing skein of yarn black to make it into a striping skein. Then we rinsed the yarn and hung it to dry. Since I had to bring mine back home, it’s been hanging from the backs of two chairs across my living room and down the hallway since Sunday night. Tonight it was really and truly dry (yes, Seattle is a fairly moist climate) so I wound it up. This required running in circles once again, this time with my ball winder. But the end result is lovely! I have decided yet if I’m going to reskein it or not. Now that it’s all wound it balls it seems kind of silly, but if I’m going to be storing it a while, it might not be a bad idea. Yesterday I went out for coffee with some friends, which turned into dinner, which turned into getting up before 7am on a Sunday to take a knitting class with Jared Flood. An unexpected but delightful series of events. I’ve been reading Brooklyn Tweed for a long time, mostly because it always has beautiful pictures. Maybe between my new interest in photography and my start at lace today I can emulate them sometime! I enjoy taking knitting classes, even though most of the time I don’t learn a lot. There comes a time when you have tried most things, and after the variety of projects I’ve made and the number of knitting classes I’ve taken (and taught) there isn’t a lot that’s really new to me. But there’s almost always *something*. Today it was a variation on the Russian join. Even if I don’t learn much, it’s still enjoyable. I like hearing from designers about what their process is, getting a sense of the person behind the patterns, and just getting motivated to start something different than my usual parade of socks. Today it was Girasole. I’ve never knit a shawl or large lace project. (I did knit the Horseshoe Lace Scarf for Fiber Gallery, but that’s a very simple lace pattern with only one motif over the project and no edging. I’ve knit lace socks that were more complex than that. Now I can pretend to be a “real” lace knitter and tell you how hard it is to photograph unblocked lace, although this one is small yet. The yarn is Lorna’s Laces Shepherd Sock in Cookie’s Deep Dark Secret. And now it’s time for the promise I’ll probably regret. I will finish this shawl before the end of the year. Oh yes, my first shawl in 2010… we’ll see how it goes.